Winners of CINE Golden Eagle Award were announced this month, and seven PBS programs were honored, including STEVE JOBS: ONE LAST THING, REDISCOVERING ALEXANDER HAMILTON, ANTIQUES ROADSHOW, BLUEGRASS UNDERGROUND and TURNING THE TIDE. 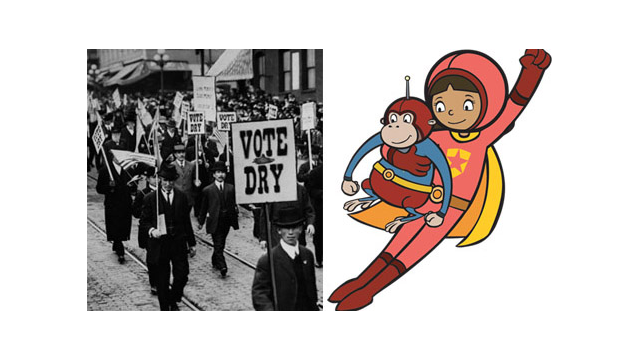 In addition to their Golden Eagle Award wins, PROHIBITION and WORDGIRL also received Special Recognition for Televised Series honors. Oregon Public Broadcasting also received an award for their program, THE MODOC WAR. In addition to the CINE Golden Eagle Award, these films are now eligible for the CINE Special Jury Award, which recognizes the best film in each CINE category from the 2012 CINE Spring and Fall Competitions and will be presented in 2013. For more information about CINE, visit www.cine.org. PBS congratulates Oregon Public Broadcasting and our PBS producer recipients on their CINE Golden Eagle Awards! ANTIQUES ROADSHOW, EL PASO HOUR 2 - WGBH Education Foundation for PBS Specialists from the country's leading auction houses and independent dealers from across the nation travel throughout the United States offering free appraisals of antiques and collectibles. This episode from El Paso found signed Andy Warhol soup cans and pop art; a collection of signed Cormac McCarthy first editions; and a circa 1570 “Lotto” Oushak rug. BLUEGRASS UNDERGROUND - Todd Squared, LLC for PBS Taped 333 feet below ground within the labyrinth of Tennessee’s Cumberland Caverns, this 12-part “musical adventure” series features the top established and emerging artists within the bluegrass, newgrass, gospel, roots and Americana genres. PROHIBITION* - Florentine Films and WETA for PBS From Ken Burns and Lynn Novick, discover the true story of America’s “Great Experiment” — the 18th Amendment to the U.S. Constitution outlawing alcohol. REDISCOVERING ALEXANDER HAMILTON - Manifold Productions for PBS Explore the legacy of Alexander Hamilton and examine what made him a great man. STEVE JOBS: ONE LAST THING - Pioneer Productions for PBS Gain unique insight into what made Steve Jobs tick. There has been near-universal agreement that the late Apple founder was a great innovator in business and technology, but why was he great? What were the influences that shaped his character and drove him to such success from humble beginnings? TURNING THE TIDE - Louisiana Public Broadcasting It is the largest coastal ecosystem in the Continental U.S. Yet, this fragile delta is experiencing the fastest rate of land loss on earth. Can innovative strategies save the vital Gulf Coast region in time? WORDGIRL* - Soup 2 Nuts and Scholastic Media for PBS KIDS GO! In this PBS KIDS GO! Series, follow the adventures of Becky Botsford, a mild-mannered fifth grader who, at the call of duty, transforms into WordGirl - caped crusader and definition dynamo.